And that’s what Alt-D, P does. It consolidates multiple data sets by strapping all the data into three generic Row, Column, and Values fields, perhaps in part because it has to be prepared to deal with variously-headed fields across the data sets. Consolidate two data sets, each comprising three fields with incomparable names (and that’s something you can do here) and you’re left to pack them all into three consolidated fields – sporting six names. Three fields, six possible names – do the math. 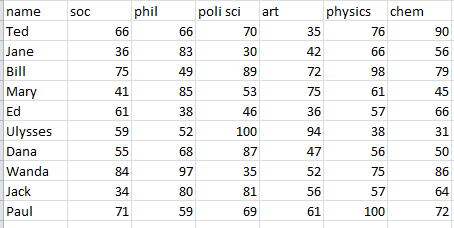 In the interests of decision-making, then, Excel fires three fields in the crucible, and names them, with all due practicality, Row, Column, and Values. Well, it beats Moe, Larry, and Curly. (My inclination here, and one you may not share, would be to entertain the TableTools > Convert to Range (in the Tools button group) possibility, so as to step over those nasty table-specific formulas – and you could also rename the field headings). 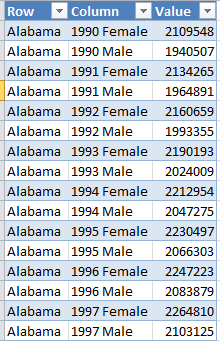 Now you’ve granted yourself three substantive breakout variables – State (again, primevally called Row), Year, and Gender, for your pivot table delectation.